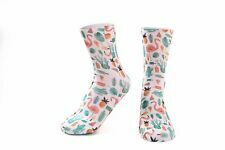 Pineapple socks.cactus socks.watermelon socks.flamingo socks.Wedding socks. • Tube socks. • Weight: 30g. Thin socks. • Dry inside out. • Machine wash cold. • Full image graphic print. • Elastic mid foot ribbing for a fitting grip. • Poly/Cotton blend ensures a vibrant image while also providing quality comfort. Chili Socks. Red Chili Socks.Vegetable socks.Farmer socks.Vege socks. Mix of no-show and crew style socks. Size large fits girl's shoe size 3-10. Lace trim may differ slightly. 75% Cotton 25% Polyamide. Available in White only. BNWT 74% cotton, 24% polyamide, 2% elastene. The usual OILILY high quality. Jacquard knitted fully fashioned socks. Blue chevron style with 'Oilily' in light blue on the ankle. BNWT 74% cotton, 24% polyamide, 2% elastene. The usual OILILY high quality. Jacquard knitted fully fashioned socks. Green and art nouveau style multi-coloured design. Three pairs of girls socks with butterflies on them. One pair hasbutterflies on them the others are striped with butterflies on them.